ENGINE: 4-cycle, 6 hp, single cylinder, air cooled engine featuring "Easy-Spin" starting and equipped with large recoil starter, oil bath, air cleaner. Manual carburetor throttle control. Remote choke control. CLUTCH: "Soft-Action" belt clutch, with spring loaded idlers and special long wearing belts give superior performance. AXLE: Specially designed 2-speed rear axle gives 2 forward speeds and 2 reverse. Geared differential gives maximum durability. Pivoting front axle allows front wheel to ride over an 8" obstacle. Drag link equipped with ball joints makes handling easier. TIRES: Soft pneumatic stud-tread full tractor tires, 4.8Ox8 rear, 3.5Ox4 front, 2-ply. STEERING: Airplane type steering wheel. 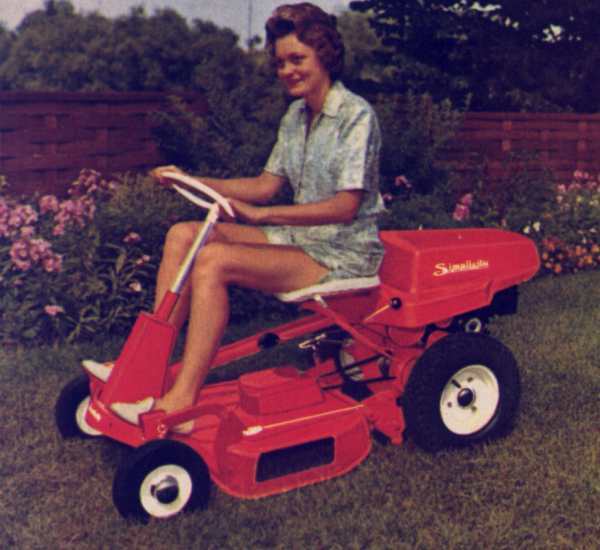 ENGINE: 4 hp, 4-cycle, Briggs & Stratton with mechanical governor, "Easy-Spin" starting, manual choke, recoil starter. Oil impregnated foam rubber air filter. Hood quickly removable for easy access. CLUTCH: Soft action, spring loaded idlers, extra long wearing belts. AXLE: 2-speed rear axle geared differential, offers maximum durability. Front axle allows front wheels to ride over 8" obstacle. STEERING: Controlled by airplane-type steering wheel. TIRES: Soft, pneumatic stud tread, 4.00 x 8 2-ply on rear. Front tires semi-pneumatic. FRAME: Heavy duty tubular steel, electrically welded.